Gettysburg is a 5-year-old horse who is 1 for 13 lifetime, lost his last two starts by a combined 32 lengths and made a total of $1,768 in 2017. His value to owners Three Chimneys Farm and Winchell Thoroughbreds? Since Gettysburg was purchased privately last fall to serve as the designated workmate to Gun Runner, the likely Horse of the Year and favorite in the $16 million Pegasus World Cup Invitational (G1) Jan. 27 at Gulfstream Park has won the $6 million Breeders' Cup Classic (G1) at Del Mar to earn $3.3 million; was announced as having a $70,000 stud fee for the 2018 breeding season (worth another $6-7 million), and will earn another $7 million if he concludes his career with a victory in the Pegasus World Cup. The silver-gray Gettysburg has proved golden in helping to make a champion. Whatever his problems in the afternoon, Gettysburg can display brilliance in morning workouts — and the constitution to keep at it. 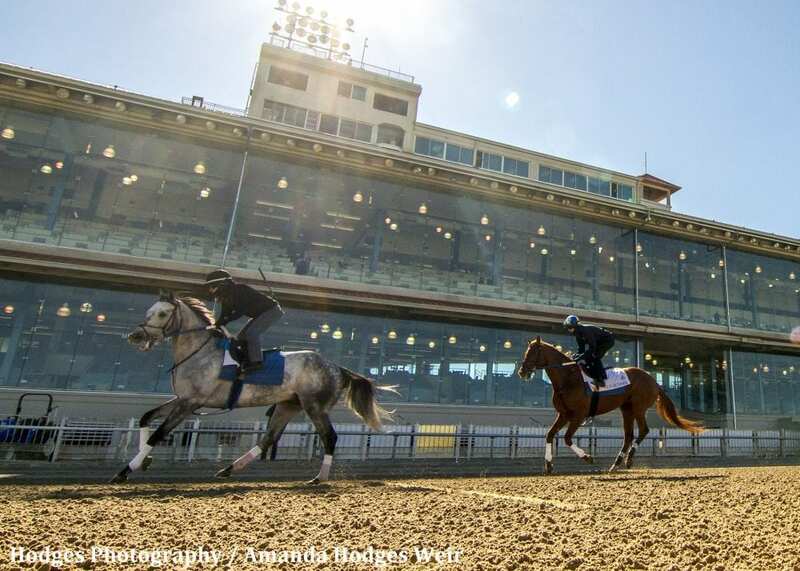 As Hall of Fame trainer Steve Asmussen marveled, few horses have the physical ability and fortitude to repeatedly and effectively work with a horse such as Gun Runner — “and keep eating,” he laughed — ensuring his famous teammate gets tested enough in training to have him at his best for the Pegasus off a three-month layoff. Think of Gettysburg as Swen Nater, who helped UCLA to a pair of NCAA titles while playing backup to Bill Walton with the primary mission of developing the All American and Hall of Fame center in practice. Having been Gun Runner's sparring partner the past four workouts at the Fair Grounds, Gettysburg gets a reprieve with the Breeders' Cup Classic winner heading to Gulfstream, where the Pegasus favorite's final tune-up will be an easy half-mile by himself the week of the race. And Gettysburg? Asmussen will look for an entry-level allowance race for the 5-year-old's first race in more than four months. “They are monitoring his health and well-being as (closely) as they are Gun Runner,” Three Chimneys' chief operating officer Chris Baker said this winter, joking, “In the weeks when he's not working with Gun Runner, maybe Steve is working him with the stable pony and letting him beat up on him to get his ego built. Whatever his future holds as a racehorse, Gettysburg will have played an important role for two classic winners trained by Asmussen. Originally owned by WinStar Farm and trained by Todd Pletcher, Gettysburg finished second off a maiden victory in the 2016 Sunland Park Festival of Racing behind Collected, the Breeders' Cup Classic runner-up also running in the Pegasus. Gettysburg followed that performance with a fifth-place finish after setting the pace in the Arkansas Derby (G1), won by WinStar's Asmussen-trained Creator. WinStar wanted to ensure a legitimate pace for the late-running Creator in the 1 1/2-mile Belmont Stakes (G1) that summer, so they ran Gettysburg, moving him to Asmussen's barn. Gettysburg rattled off 12-second furlongs throughout the Belmont and Creator took advantage of the pace to win the Triple Crown finale. For whatever reason, Gettysburg has yet to get over the hump as a racehorse. WinStar sold him in the weeks before the Breeders' Cup. Asmussen said Gettysburg is reminiscent of another Winchell horse, Gold Hawk, who helped prepare Untapable for her 2014 championship season that included winning the Kentucky Oaks (G1) and the Breeders' Cup Distaff (G1). The well-bred Gold Hawk won his first two races and looked like a possible Kentucky Derby contender. A well-beaten third in the 2014 Lecomte (G3) was as close as he got, but he earned his keep in a supporting role. Asked what Gettysburg got out of the works with Gun Runner, Asmussen said, “A lot media attention. He is without a doubt my most talked-about (allowance horse) I've ever had. This entry was posted in NL Article, Pegasus World Cup and tagged breeders' cup classic, gettysburg, gun runner, Pegasus, pegasus world cup, steve asmussen, Three Chimneys, winchell farm, winchell thoroughbreds, winstar, winstar farm by Press Release. Bookmark the permalink.